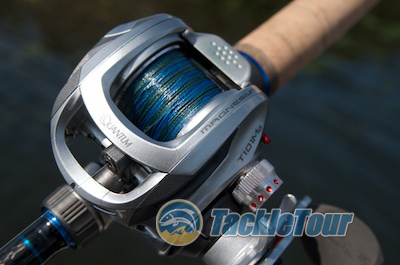 Quantum's First Magnesium Framed Reel, the Tour Mg! Introduction: There was a point in time, several years ago, when someone showed me a reel from Quantum, my first thought before even handling the reel was "heavy". My impression of reels from this manufacturer were they had a solid, heavy feel in your hand. Then, not too long ago, they introduced the Smoke - a relatively small, lightweight, almost bare bones reel that performed well. The year after that came my favorite Quantum reel, the EXO. Remember that five second test? Well, at ICAST 2013, Quantum impressed me again with what I found hard to believe was their very first foray into a reel made of this material. Here now is our look at Quantum's Tour Mg! 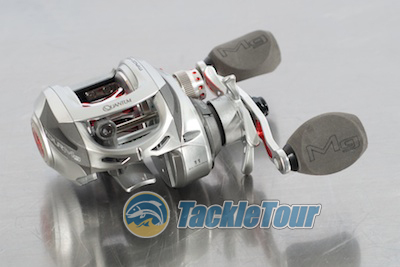 Introducing Quantum's Tour Mg magnesium framed casting reel. 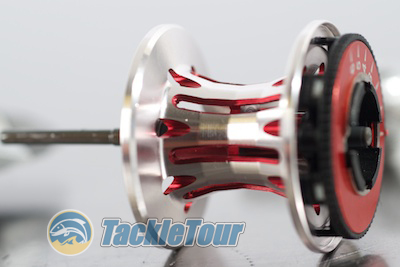 Quality/Construction: Most reels today that are finished with paint feature some kind of metal flake. This metallic flake adds a bit of texture and refinement to the overall finish. The Tour Mg features a two tone sliver and dark grey finish, but the silver paint doesn't have that metallic luster to it and you can see some inconsistencies in the finish - they're very slight in our review sample, but they are there. The Tour Mg features a silver and grey color scheme. Running my fingers over the joints and seams, the tolerances are good, but could be better. Alignment of the sideplates to the frame is just a fraction of a millimeter off in some places. As for the handle, there is zero backplay in the handle but a small degree of movement if you push and pull the handle into and away from the reel. There is also a small degree of wiggle in the knobs. Performance: I spooled the Quantum Tour Mg with some 50lb Sunline FX2 braid and mounted it on a couple of different rods for our tests. One was a Dobyns Rod CB765 cranking stick and the other was a Quantum EXO Tour EXTC726XF all purpose rod. Spooled with 50lb Sunline FX2 and ready for testing. Casting Range: Given the line and rod pairings I had on this reel, I wasn't expecting anything monumental in terms of its ability to handle casting duties of super light baits, but I was pleased with my results. Paired with the EXO Tour EXTC726XF (a "medium heavy" stick with an extra-fast tip), I tested the lower range of the Tour Mg by tying a bare mosquito hook and nose hooking a Zoom Baby Brush hog. 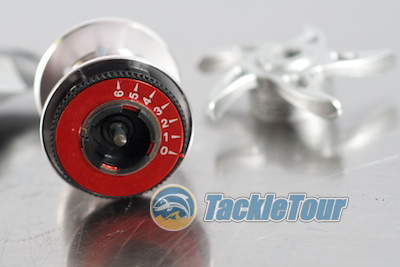 This aggressively ported spool is responsive with baits down to 1/4 oz with the potential for even lighter lures if matched with the right line and rod. I was quite pleased and surprised that the Tour Mg seemed to handle that bait quite well, but when we returned to the lab I was disappointed to find that bait combo weighed a whole seven grams - that's just about one quarter of an ounce. I was hoping that setup would be less. In any event, I'm pretty certain matched with a more finesse minded line and rod, the Quantum Tour Mg could handle even lighter baits and therefore serve as a good finesse baitcaster in a pinch. Centrifugal casting brakes are adjusted via this dial. Brakes: The Quantum Tour Mg is equipped with centrifugal brakes adjustable by removing the sideplate and turning a dial on the reel's spool. The sideplate itself is a little tricky to remove and is not attached to the frame so any adjustments are best made away from the water's edge. 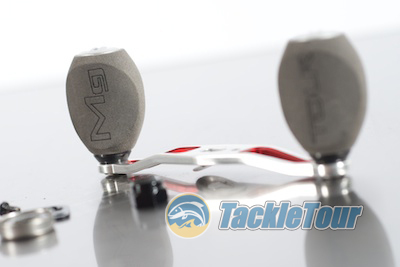 The main gear of the Tour Mg is made of an aluminum alloy. 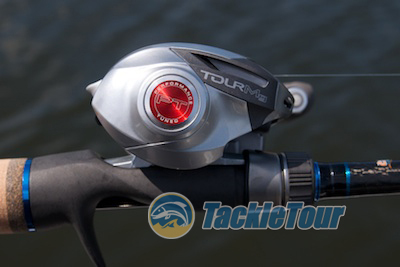 Retrieve: To help keep the reel's overall weight to a minimum, Quantum used what appears to be an aluminum alloy for the Tour Mg's main gear. Aluminum is a lighter than brass, but also transmits vibrations more efficiently. 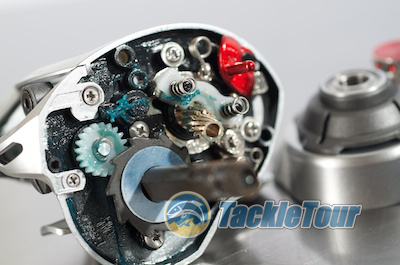 When used as a main gear, the end result is a more connected feel to your reel's mechanics because the main gear is made from a more lively material. Ample grease on the inside of the Tour Mg helps smooth out the retrieve. 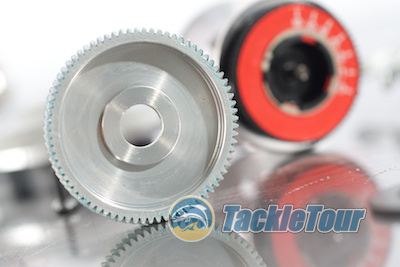 This connected feel is pretty common among reels with aluminum main gears, including the great majority of magnesium framed reels. The Tour Mg shares in this result but to a lesser extent than other Mg reels I've used. Overall, the smoothness of retrieve is very good. The Tour Mg's handle measures 86mm center to center of each knob. As for actual retrieve ratio, the Tour Mg is available in two: 7.0:1 and 6.3:1. Actual difference in inches per turn between models is between two and a half to three (2.5 - 3) inches. Both models are available in both left and right hand retrieve!